Coming Untrue: What About the Witches? The most extraordinary thought occurred to me today. Anyway, one of the funny things they do is to call up the alleged records of theist “atrocities”, which of course they then want to attribute to all Christians. Apparently, we’re responsible for everything from the Crusades and Inquisitions to the Holocaust and (according to atheist popularizer Bill Maher) “all the wars”. If this lack of any historical or theological awareness were not funny enough, a favourite canard of theirs actually involves the Salem Witch Trials. 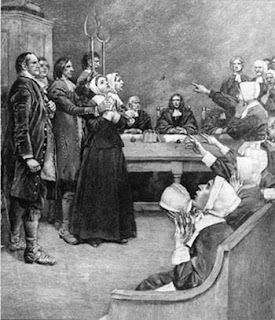 Over three hundred years ago, a group of religious conservatives known as the Puritans in Salem, Massachusetts hanged twenty (20) people under the charge of witchcraft. Now, this was in an age long before the Internet, news, photography or even modern historical methods. But somehow, the atheists have managed to retain the names and circumstances of the twenty victims. Not only that, but they’ve apparently retained their righteous rage on behalf of these executed persons. They have no hesitation to bring up the incident, and to gleefully rub the faces — not just of Puritans, but of every kind of theist imaginable — in the dried blood of these ancient victims. You’ll hear that one over and over again. I sent him a link to the Katyn Forest Massacre. But I could as easily have pointed him to the Killing Fields of Cambodia, to the re-education camps of the Maoists in China, to the gulags of the Russian archipelago, to the pits and ditches of the National Socialists in Germany, or to any of a thousand other locations in which a spade and a will to know are all you need to see the blessings of atheism up close. The guy took one look at the picture, and asked me how I knew for sure that the executioner wasn’t a wayward Catholic who had been at Mass that very morning. It seems that atheists can locate the bodies of twenty people killed by religious enthusiasts three hundred years ago, in an age when the printing-press was state-of-the-art record-production. But in an age with modern historical records, journalism, television, the Internet and Wikipedia [or, better, Infogalactic, Ed. ], they can’t find any of the one-hundred and forty-eight million people killed by atheist regimes in the last century alone. So the atheist can find 20 bodies from three centuries ago, but can’t quite locate the 148 million they piled up in the last century. Can’t find ’em. Not a one. Well, I suggest we take up a collection and buy him a shovel. If he and his rabid-atheist kin still refuse to employ it to verify the bloody deeds of the atheist murderers of the last century, perhaps he can at least use it to manage the wave of hypocritical horse manure continually threatening to surge out of the atheist barn. In my experience, the answer is that they’ve got nothing. Nada. Zip. Just their cynicism and their overweening sense of superiority. Get a few things figured out, and their arguments are exposed as astonishingly irrational. But just how far will they go to slander their opposition and to hide the atrocities committed by their atheist brethren? The Salem Witch Trials actually furnishes a perfect illustration, I think. But not as an indictment against theism. Rather, it’s one of the most embarrassing facts that atheists even mention it, because it illustrates how they argue. It shows that for some of them, there is quite simply no evil that atheism can occasion that is big enough to elicit from them an admission of fault. And there is no accusation so remote, vague, indirect or irrelevant that they will not apply it to theism, and act self-righteously justified when they do. But if you need reasons to doubt the sincerity or integrity of such atheist attacks, I suggest there are at least 148 million. * And that by the most cautious estimates: check the massive and very secular, three-volume Encyclopedia of Wars (2004). If you want an easier and less-expensive read, you can also find this data all broken down for you in very specific tables in The Irrational Atheist (2008).